We already knew that Japan gets all the cool stuff and today I have even more proof of this. Final Fantasy IV, V and VI are getting remastered soundtracks! 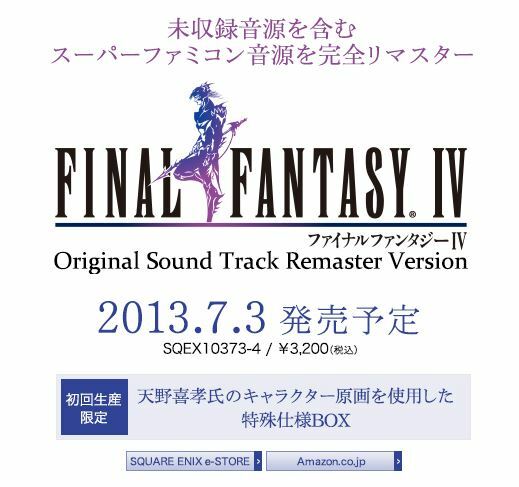 Final Fantasy IV Original Sound Track Remaster Version will be available on July 3, 2013 through the Square Enix store. The price tag on this must-have item will be 3,200 Yen or $32.29. While the Final Fantasy IV soundtrack can currently be tracked and even pre-ordered through the Square Enix store, the dates are not yet known for Final Fantasy V or Final Fantasy VI. I scanned through the store and did not see a listing for either. Hopefully we will have more information about the availability of those soon.